December 21st is officially National Crossword Puzzle Day! Why not take this opportunity to add crosswords to your classroom arsenal? 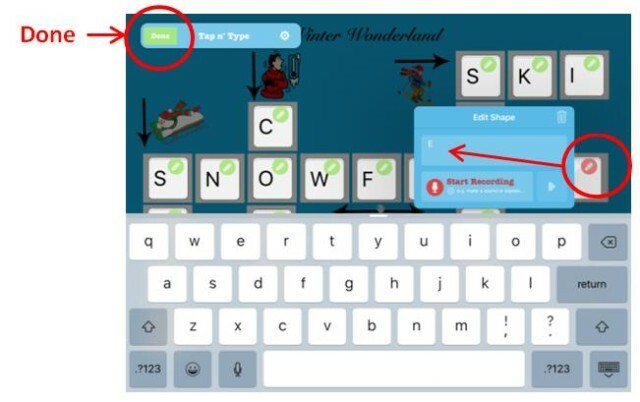 With TinyTap’s newest feature Tap n’ Type, it’s easy to create customized crossword puzzles to practice spelling words, reinforce vocabulary, teach understanding of visual and verbal directions, add fun to literacy centers, create cooperative group projects, or substitute an interactive game for the same old boring paper-and-pencil homework. 1. Create the letter spaces, using the grid lines to line them up neatly. (You can find different colored squares in the Colors and Shapes Creation Pack). 2. Add all the boxes for all the words, along with the clues. (This particular example uses visual clues and a “word wall” to choose from). Select “Add Activity” when you are finished. 3. Record your introduction/instructions, then create your hotspots for typing the letters in each box. Pro tip: To make sure your typing hotspots are a uniform size, double tap a finished hotspot to duplicate the shape, then slide it into place – see how. 4. Tap on the pencil icon to open the typing box, enter each letter in each box for all of the words. Tap “Done” when you are finished. Ellen Weber is a veteran TinyTap creator and pediatric SLP. Check out her TinyTap collection.